When the flag is hoisted in the morning, it should be raised to the peak (top of the pole) for a few moments, then lowered to the mid-way point on the staff. When the flag is removed at the end of the day, to not lower it from the half-staff position. First the person(s) detailed to lower the flag should raise it to the peak of the staff, then slowly lower it from that point. On Memorial Day the flag is flown at half-staff only until noon. The proper sequence for displaying the flag on this holiday we have set aside to remember the more than one million men and women who have died in defense of our Nation is: in the morning the flag should be attached to the halyard and raised briskly to the top of the flag pole, then slowly lowered to the mid-way point of the pole. At noon the flag should be raised to the top of the flag pole. At the end of the day the flag should be slowly and ceremoniously lowered and removed. In 1962 the date of May 15th was designated as Peace Officer's Memorial Day, "in honor of the Federal, State, and municipal officers who have been killed or disabled in the line of duty. On this day the flag should be flown at half-staff for the full day, unless May 15th happens to also be the third Saturday in May, Armed Forces Day. In the rare occurrences when both holidays fall on the same date, the flag should be flown at the peak. Whenever a present or former official of State Government dies, the Governor of that State can direct that the United States Flag be flown at half-staff in respect to their memory. Q. 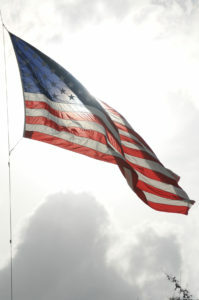 Is the flag only flown at half-staff in respect to the memory of government officials? A. No. The president can direct that the flag be flown at half-staff as a symbol of respect for great Americans who are noted for their non-government service and achievement. Q. Is the flag only flown at half-staff in respect to the memory of U.S. citizens? A. No. The president can direct that the flag be flown at half-staff as a symbol of respect for other officials and foreign dignitaries.